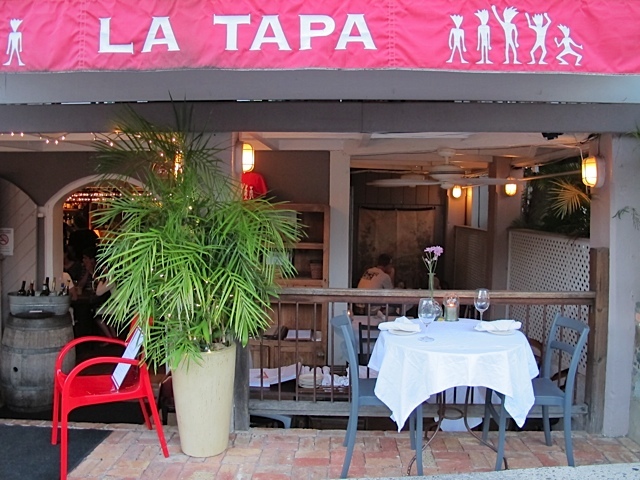 It’s the last week before La Tapa closes for the season. Best Chef Alexandra Ewald takes off two and a half months during the slow spell every year, as do most chefs in St. John. The way of being is different here in the US Virgin Islands. Many of her customers are locals. Some are expats who found success living in the Caribbean. Others are travelers on a tropical getaway, who find La Tapa while strolling down the street past Woody’s, the bar famous for its $1/drink happy hour. They make eye contact with Ewald. She invites them inside like she’s inviting them into her home. Ewald’s a believer in karma, and considers it the job of everyone who works at La Tapa to provide whoever walks in with an enjoyable experience. We arrived at 4:30 p.m. to make reservations, right as Ewald was making notes on last night’s menu to reprint with today’s ingredients. She collaborates with the cooks to design a new menu each day. Each dish uses a different version of every ingredient. There must be different textures and colors on every plate. As she makes edits, the staff sits on stools eating their nightly pre-service meal. When she finishes, they'll proofread the menu together, to catch typos, to learn the details of every dish and the best wine pairings. St. John is not a hotspot for agriculture, so she can't source local. It's a con of island living. There’s a woman named Josephine who grows acres of greens and herbs outside of Coral Bay, and it’s a miracle she makes this happen in a climate without seasons. Fresh fish is what the Virgin Islands have in abundance. A fisherman will bring an 80 lb. 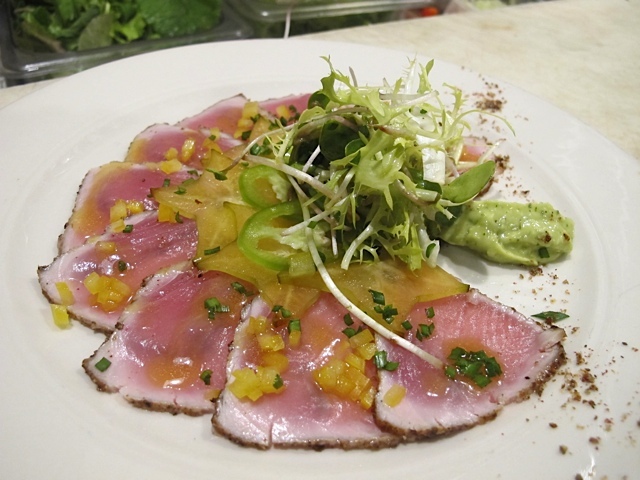 tuna or wahoo through the dining room and every customer will turn their head. Cooks say fish in the VI is the some of the best they've ever seen. The fresh catch today is lobster Ewald snared herself while boating with her boyfriend in secret spots around St. John, on the crystal blue Caribbean Sea that teems with marine life. Tonight, she’ll put the lobster in risotto, garnished with sugar snap peas thinly sliced on a bias and fresh basil from Josephine. The other fresh catch is mahi, brought in by a local who runs commercial fishing boats for tourists. Ewald seasons this with green curry and coconut milk. The mahi comes out on a bed of vegetables and black orzo. Everything else has to be ordered from the only food distributor that services every restaurant on the island. La Tapa opened 20 years ago as a traditional tapas restaurant that served 15 or so snack sized dishes each night for $3.50 a pop. Although she loved this style of food, Ewald quickly learned that the Virgin Islands are not like Spain, where people go and enjoy hors d'oeuvres before eating larger meals elsewhere. So she began to offer entrees. La Tapa grew in popularity and profitability, and soon all that was left of the original concept was Ewald’s culinary ethos and the name. She says her food is more about balance than anything else. She keeps small plates on the menu for people to share; Platos Pequenos that are divided into sections like vegetables and cheese, for the carnivores, of the sea. Start your meal with fresh baguette paired with olives, the house olive oil (called La Tapa Oil) that is infused with garlic, parmesan and herbs, or the three sauces of the day, which this evening are arugula and green pepper aioli, sundried tomato aioli, and a tropical salsa. If you order a cheese plate, a member of the waitstaff will come over with a tray filled with huge wedges of salty and stinky cheese, in styles that range in age, milk source, and butterfat content. This is very typical of the cheese carts in France, Ewald says. The waiter or waitress will slice off the cheese you select to place on a personal board. 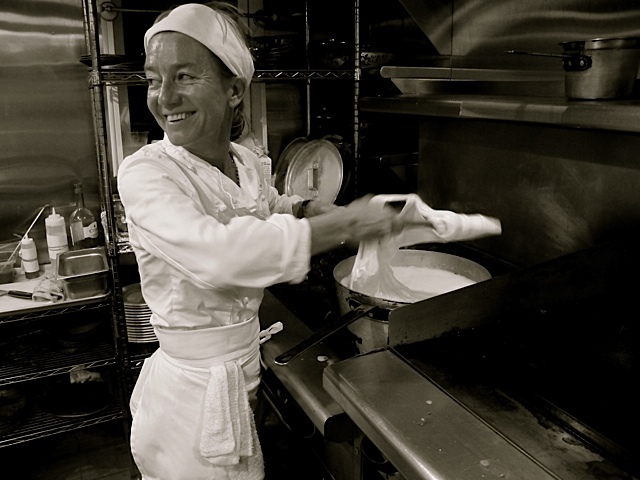 Ewald, whose father is a German restaurateur, spent much of her life before moving to St. John working at his restaurants and others in culinary destinations across Europe. She brings that experience to La Tapa, making it one of the most - if not the most - cultured and creative dining options on St. John. They handpull and shape mozzarella from curds. Today the mozz is paired with an eggplant, fennel, tomato, and caper caponata. The kitchen has made over 100 different set ups of fresh pulled mozzarella over the years. The other small plates are crafted with a similar finesse. A large cut of sweetbreads is coupled with pea shoots and fresh greens. The duck confit comes out juicy and crispy in a pool of passionfruit and apricot gastrique. Every style of meat - whether braised, seared, or pan fried - is prepared with technique that locks in flavor and captures multiple dimensions of texture. For dessert, the kitchen makes a different bread pudding each day with homemade ice cream or sorbet. The chocolate torte comes with carajillo ice cream, inspired by the Spanish drink made of flambeed liqour and espresso. La Tapa's carajillo ice cream is spiced with cayenne pepper. Our waiter reveals Ewald is a collector of sorts. 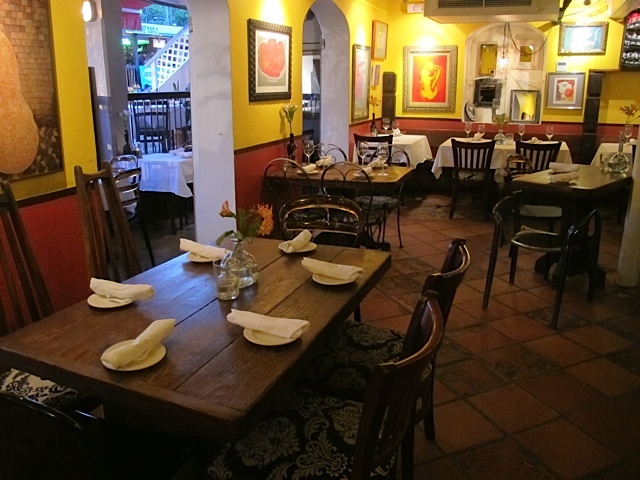 The yellow walls of La Tapa have an ensemble of paintings hanging on them, as well as inset shelves that display a few sentimental oddities, like the yellow high heeled shoes that belonged to a beloved St. John community member who unexpectedly passed away. Ewald likes for beautiful things and beautiful memories to live on. She likes to be a supportive part of the St. John restaurant community and community at large. And perhaps this attitude is why La Tapa is able to retain a feeling of purity in a tourist hub swarming with burger bars, rental car companies, and gift shops selling mass produced visors and flip flops. In the middle of paradise, La Tapa silently sets the standard for every restaurant on the island chain, thanks to Ewald's skill and grace.